Consider this. If the entire season was tabulated in the form of a baseball game, meaning that each of the 54 outs recorded in a game would be translated to represent each of the 162 scheduled games, the Twins haven’t even recorded the second out of that very game. That’s a super complicated way of synthesizing that the season is grueling monster, and that 4 games can't really convey any semblance of what the Twins midseason form might be, much less their state come season’s end. Sample size is a word occasionally tossed around as a gauge to what’s legit or not, and no matter how much of a buzzkill word sample size is, it's a small sample size. You can’t go wrong with 4-1, but playing a awfully decimated Indians club and the tantalizingly pesky and obnoxious, but inferior Royals rosters does nothing in solidifying or cementing our far-fetched hopes to a stellar season. So people don't get all worked up or hyped that Byron Buxton’s hitting .500, or that Marwin Gonzalez cannot hold the trigger on a curveball for his life, or that Willians Astudillo is current sizing up as the best hitter in the history of baseball, because the reality of it is that these players either scorching hot or ice cold will eventually fall in line with their typical production outputs, UNLESS there's some superior extraneous force that might mitigate someone’s (wink*wink*Logan Morrison wink*wink*) career slashline. Typically in baseball you don’t see dramatic changes in someone’s batting line for example, and prospect development is a great indicator of this, unless there’s a change in scenery, or shift in a regime (managerial usually). Here is one physical scenario. I wanted to chose someone someone semi-millennial, preferably still active to debate this debate or myth of the hot-hand effect. During the 2013 season, Jose Altuve didn’t have a firm-grip in the major leagues. On a rather atrocious Astros club that had stunk for a long time, spanning back to the Carlos Beltran days, they were scuffling and being spanked in the shadows of their unforsaken superstar. Under manager Bo Porter, unbeknownst to the Astros that they would have 2 MVP candidates and Hank Aaron best hitter awards, under their 2013 disposal (JD Martinez and Jose Altuve), they wound up a travesty rather than a juggernaut, drowning under 4 consecutive seasons of sub-60 win play. After Martinez was run outta town, Jose Altuve barely scraped by as a undrafted free agent and frankly played above expectation with all-star accolade to this credit. Nonetheless he hit .276 during the beginning month of April in 2014, pretty accurate representation of his career to that point. From that point on, Altuve wound up hitting a whopping .357, and vaulting his name into the MVP conversation, and having the best batting average, most hits, and 10th best OPS in the AL for what it's worth. A bargain in my boat, for a player that hadn’t exceeded an average above .290 and amassed a 6.1 WAR after a 2013 WAR of just 1.0! That’s one way you could express how little the first handful of games has on the rest of the season. 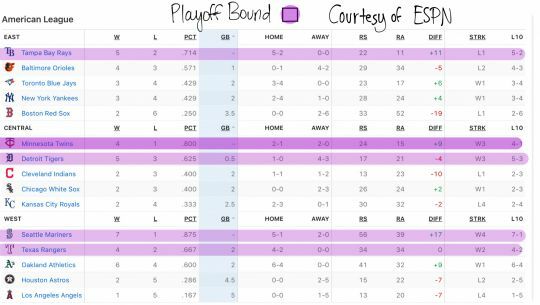 The Twins postseason road down look as bleak as it did a few years back, however there’s little doubt that the behind the Yanks or Sox, their is a tier of about 3-5 clubs that could contest for the final spot and courtesy to play the latter of the loaded brethren in the AL East. The Rays and Athletics are also both, ballclubs that could collectively catch fire at any point if all things go right respectively, and the Angels aren’t a snooze themselves with perennial sluggers who could easily foil the Twins plan. The final spot should be hotly contested and the Twins need to orchestrate a bunch of runs, and configure somewhat of a capable staff, that has room for improvement. So, if your left partly conforming, or a down the middle perception on this club, that’s okay. I reckon that is the first team in years, that in every department of the roster I could point to that position group carrying the load. The offense is as dynamic and stacked in this century as it ever will be, the starting pitching staff possesses some electric and bat-missing stuff, and the bullpen has the makings of a shutdown backend if things goes according to plan. Not enough yet to be playoff or bust, but something around the ballpark would be fair. So I caution those jumping on the bandwagon and already scoreboard watching, to take the opening week of games with a grain of salt. So those needless stats of the 1 HR, and the insane 0-fer that Eddie Rosario snapped don’t really have tangible effect through the course of a season. Jose Berrios’s 10k, 7⅔ outing was impressive and all that, but really does it do a testament on Jose’s stuff or really just crucifies how mishmashy the Cleveland lineup is in its patchwork. How many times have we heard that the road to the Twins postseason runs will go as far as Buxton and Sano goes? Well the reality check is, Buxton is showing signs of improvement and candidly is playing as purposefully as I've ever seen and Sano isn’t on the roster. More or less, to the antithesis of Sano’s and Buxton’s liability to this team, is how important the newcomers need to perform to keep this team from falling off a cliff. Is it to early to say, that I sense collapse over the horizon? Regardless of how explicitly I may tread to heed caution, I can’t even refrain from excitement, myself. What’s for certain though? That this season will go haywire, for good or bad, and whatever of which will only the heighten the scope of interest on this club. So, (Don’t Jinx it, Don’t Jinx it, DON’T JINX IT) this season gonna be crazy good. The Phillies will provide a great litmus test of superior competition nearing the weeks end, and let’s just hope we give it to them good, and scurry to the Bronx with something more than a .500 record. The good teams find ways to come back to win more games than one would expect. The Twins seem to be doing that so far. Cleveland doesn’t look like a power team. I see them winning the division with 86 to 90 wins. The Phillies are not a litmus test because the Twins will be playing without the DH, which the Twins will be able to use 95% of the time the rest of the season. This weakens the Twinkies' lineup, no matter whether Cruz plays or not against the Phillies.In summation 4-1 is better than 1-4. And that's all I've got to say about that. The Phillies are not a litmus test because the Twins will be playing without the DH, which the Twins will be able to use 95% of the time the rest of the season. This weakens the Twinkies' lineup, no matter whether Cruz plays or not against the Phillies. In summation 4-1 is better than 1-4. And that's all I've got to say about that. I’m not really sure on what your getting at with referencing the DH. I just meant their lineup would provide an early indicator for how well-equiped in terms of ‘stuff (or) it factor’ this roster has (more faceted towards the pitching staff then the batting lineup). The Phillies have arguably from 1-6 the most deep lineup in baseball, and from a quality of competition standpoint it would be worth-while to see how they perform against stiff opposition and in a wild and hostile environment. I would key on Taylor Rodgers against Harper and see how that offspeed arsenal will play against a stellar bat. I don’t really get what you’re saying by DH and the lineup not facing quality completion. So far, they’ve faced 3 potential aces in Kluber, Bauer and Carrasco and some more inferior pitchers in Homer Bailey and Brad Keller and haven’t performed spectacularly by any means. Nick Pivetta (starting tonight) is one of my favorite under the radar pitching prospects in the NL (iffy control though, wipeout curveball ala Nola’s curveball), so watch out for his stuff. Obviously Arrieta is in a tier of his own, and Eflin shouldn’t be taken lightly either. I would also point to that the Phillies are among the league leaders in breaking ball percentage, and the Twins typically struggle against breaking balls (curveball and slider), so I would keenly watch that. Oh and Btw, thanks for commenting. Really interesting to listen to other people’s thoughts and/or perception(s). Feel free to add your input in the future. Thanks. These number fluctuate a lot, but I would say the magic number is probably gonna be higher than 90. I think you get lower divison title clinching records with better completion. Look last year at the with the brewers or dodgers. From top to bottom that divison was competitive, and they beat up on each other. So I wouldn’t necessarily that either of these teams will run away with it, but the number maybe like 93 or 94 because it isn’t breaking news, the royals, tigers, and white sox are godawful and whoever both the Indians and the Twins will be provided a cushion so the latter will more likely get a wild card than say perhaps the Rays or Angels. I wouldn’t count out the Indians making a last ditch effort this year. Squeeze out the last of this rotation for the present, and they could easily bandage that bullpen in a matter of moments. If the Nats or White Sox are out of it, look out for some quick aid to shore up the secondary relievers. Pure speculation (and contingent on if their in it or not, and are receptive to making deals) but I’ve always had a hunch that Alex Colome, or Kelvin Herrera would avenge their losses and come and deliver one final knockout blow to the Twins. I’m not really sure how this got here, anyways. Seems like Cleveland and the Twins are trying to out cheap each other while everybody else is rebuilding.Go Saints. Cleveland will be a factor all year, we know this. But at one point last year we were 7-2 against their throat grabbing team before we tanked the whole last two months. Listen, if we take care of business and beat up on the Royals, Tigers, White Sox(dang auto correct), and Yes, the Indians, we win the division by ten games. By the All Star break we go shopping. Yeah sure, their time is up. Look, Im tired of all this. We will show the world that our time is Now. If some of you wanna crown the Indians, then go ahead and do it. The truth is they arent even as good as the 2002-2010 Twins teams were. Who could ever lose to the CUBS in any World Series. 2019 WS Champs baby, WOOOOOOOO!!!!!!! Why isn't there a 80-89 wins without playoffs scenario? We did go 29-26 for those last 2 months of "tanking" last season. 90 would win the division but if we win the games we should win(unlike 2018) we go 95-67. I have said all along last year was so maddening. Nobody could see Lynn was 30 days behind everyone else? The day they traded Escobar he pitched a Gem in Fenway for the win. Rodney is someone i bet they wish they still had. Some of the trades made sense but come on? Pressley to the Astros??? We all knew how good he is getting. It's a shame Mauer had to retire on that dismal note. → Pump the brakes on the hypetrain people.